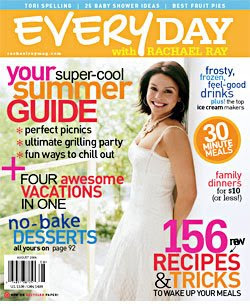 After having a June-July issue, Rachael's Ray's magazine, Every Day with Rachael Ray, is back to its monthly schedule again now that it's August. I really hate those double issues because I know I have to wait forever for the next issue! Unlike when I read my Us Weekly (which I read from cover to cover), I always jump right to the Weekly Menu Planner when I get my Every Day with Rachael Ray. I've already made three recipes from the Planner this month - Chicken Succotash, Cheesy Grilled Eggplant Panini, and Beefy Tex-Mex Stir-Fry. They were all great, so look out for reviews in the future. You can sign up to receive a new Weekly Meal Planner each week here. Next, I jump to the 30 Minute Meals section, since those are the next set of recipes I would consider making right away. In August, there are recipes for Corn and Salsa Tortilla Soup, Spaghetti and Clam Sauce with Grape Tomatoes, Grilled Hot-and-Sour Shrimp with Watermelon-Watercress Salad, Sloppy Veg-Head Joe, Halibut with Corn Gravy and Chive Mashed Potatoes, Devilish Sesame Chicken with Green Beans and Scallion Rice, Creamy Parsley and Pistachio Fettuccine, Red-Eye Chili Gravy Steaks with Cheddar-Chive Polenta, and Lime Rickey Chicky and Buttered Almond Rice. Silvana Nardone's No Recipe Zone helps you take advantage of your outdoor grill in hot weather with Grilled Corn and Sausage Flatbread. On the same theme, you can cool down with Daisy Martinez's Chilled Cucumber-Lime Soup from her Mucho Gusto feature. Since everyone I know is getting pregnant these days (okay, maybe I'm being a little over dramatic, but you know what I mean! ), I was pleased to see a party planning guide for a baby shower. Anony - that's the cover that's on my August issue! If you're looking at the In the Magazine section of the mag's website today, it's now showing the September cover (the blue themed one). P.S. I know I'm talking to Madeline, a woman, but doesn't Rach look cute on this cover? I almost always find Rach cute, but sometimes especially so. This is one of those cases.